One of my favourite blogger competitions are creating outfits, I’ve posted a few entries recently and was so chuffed to find a Boohoo.com contest! I was only looking on the website last night eyeing up the things I wanted so for me this competition was easy because firstly, everything is so cheap so buying an outfit for £50 is no problem and secondly, I like everything on there so I don’t have a problem styling items from there! The challenge is being run by Fashion Vouchers for four bloggers to win £50 in BooHoo vouchers. You can enter the contest here. Flatform shoes have been popular this summer and I keep seeing them featured in other fashion bloggers “OOTD” posts and now I’m quite interested in them myself although I wasn’t originally that keen on them. These flatforms are black meaning they can be paired with a variety of outfits which is what I like about them. This also goes for the skirt and shirt, they are both plain so are easy to pair with patterned items which are sometimes difficult to style. 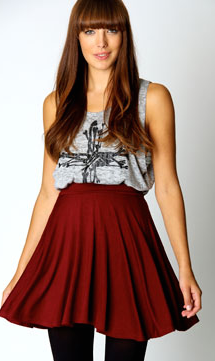 Skater skirts are in fashion this A/W and I have been noticing them in many stores at the moment. It’s very similar to a vintage skirt I wanted to buy at the weekend (damn you 100 day challenge!) The reason I chose the shirt is easy – it’s studded. I am obsessed with all things studded at the moment!